Everything you need to make communication easy for your business with a Hosted PBX. We are highly recommended within the telecommunications industry, with a massive 18 years of experience. We are in tune with all the latest technology and security measures to ensure we provide the best hosted PBX service in South Africa. All of our methods are tried and tested, meaning you can rest easy in the knowledge that you are investing in phone system solutions that work and are right for your company. If you own a small, medium or large size business that is looking to upgrade its communication network, then feel free to contact us today. We have offices in Rustenburg, Klerksdorp, Brits and Mahikeng. We will bring all the features and benefits mentioned above directly to your office door, hassle free. Take the first step in massively reducing expenses by contacting us today. When moving your pbx into the cloud, expect a 30-40% reduction on call costs. With this solution there is also no hardware to be installed at your premises, no hardware, no technician, this all leads to lower overall costs. With cloud pbx, should any issues arise, they are all taken care of remotely. This means no waiting for a technician to get to you onsite. Your issues are dealt with swiftly and sometimes without you even knowing. With your services now terminating over the internet, there is now only one network point powering your pc and your phone. This is a guaranteed saving on your electricity bill and once again reducing your carbon footprint. Every little bit counts. 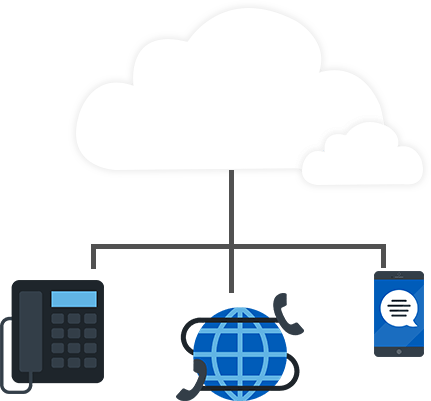 Most features on a cloud pbx can be added with the flick of a switch, Need voice logging, no problem, need call waiting, no problem, need telephone management, no problem. Whilst all of these features are a major bonus’s going cloud, the handsets are pretty nifty too. Most having LCD displays, making life very easy. Need to move office? No problem, unplug your network point, pick up your handset and plug in at your new office. No costly setup as you see with relocating an onsite pbx. Same goes for adding or subtracting staff, just do it, no issues, no wasted costs, no wasted hardware. Scale app and scale down at will. With no hardware onsite, there is no need for a technician to drive to your place of business, attend to your issues and then drive back to the office. This reduces your carbon footprint. Cloud pbx solutions also guarantee a reduction in electricity usage. Save costs and save the earth. In today’s world, voice is so much more than just a phone on your desk: it has evolved into a complete communications ecosystem that allows your employees to connect and collaborate whether at the office, at home or on the road. Consensus would like to send you messages about our products and services, but you will need to confirm that you would like us to do so by ticking this box. You will have the right at any time to opt out of receiving them. You can also change your contact preferences at any time by accessing our contact preferences centre.